Fig. 2. Schematic of the method used for human MRS4 sequence retrieval through homology with yeast MRS4 protein. AV704087 ADB Homo sapiens cDNA clone ADBAFE05 5'. Fig. 3. Result of a BLAST search with the yeast MRS4 amino acid sequence. Alignment of the yeast and human sequences identified two blocks of homology corresponding to two different reading frames (amino acids 120-231 for frame +1 and amino acids 13-105 for frame +3). Dashes indicate the gaps between the query and the retrieved sequence. highest E values, with high identity and a low percentage of gaps, are obviously the most likely candidates. It should be kept in mind, however, that high E values can be associated with genes encoding proteins of similar function, the highest score not always corresponding to the gene of interest. A simple way to discriminate between two or more eventual genes encoding different proteins of the same family is to check the origin of each EST. This can be done with the UniGene server,7 which consists of a collection of human sequences, defined as clusters representing a unique gene with its map location and the corresponding ESTs. In our example, we search UniGene with the AV704087 EST, presenting the highest homology score (E = 7 x 10-39) with the yeast MRS4 protein sequence. The corresponding UniGene cluster (Hs.326104) corresponds to MRS 3/4 putative mitochondrial solute carrier, whereas the UniGene cluster Hs.300496 (mitochondrial solute carrier), which can be retrieved with the AI133696 EST, with a similar high homology score (E = 1 x 10~33), does correspond to another gene encoding a mitochondrial solute carrier. As this last EST corresponds to an already identified gene that is not the human MRS4 counterpart, AV704087 seems to be a better candidate to represent the human MRS4 counterpart. A similar search should be done for all retrieved EST sequences in order to identify their origin. In our example, 12 of the 20 first ESTs correspond to Hs.326104 and 8 to Hs.300496 UniGene clusters. 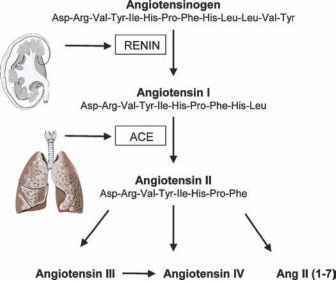 Alignments of ESTs similar to AV704087 and belonging to the Hs.326104 Unigene cluster, using the Multiple Alignment program,8 are used to confirm that they all correspond to the same gene. In our example, EST AV704087 is one of the largest ESTs (681 bp) but represents only part of the human cDNA. To possibly identify the 5' and 3' parts of this sequence, AV704087 is used as a template to identify additional human ESTs. Such identification can be done with the BLAST Search program,6 using the blastn option, which compares a nucleotide query sequence against a nucleotide sequence database, the database to be used being est_human. Several additional ESTs are thus identified that share high homology with the 3'-half sequence of AV704087. The first 15 ESTs overlap and are highly similar, some of them having a longer 3' end. Some of these ESTs are in the opposite direction (indicated by plus/minus). In this case, the sequence can be reverted by using the Reversion Complementation program from BCM Search Launcher.9 Finally, the alignment of all the sequences, using the Multiple Alignment program,8 allows construction of an EST contig. In our example, one of the ESTs (AA743110) appears to present a poly(A) tail, indicating that the complete 3' part of the cDNA should be included in this 1255-bp-long contig. An EST contig possibly contains several errors, as the EST sequences are only "single-pass" cDNA sequences. These sequence errors can often be corrected after comparing the EST contig with genomic sequences provided by the complete sequence of the human genome that is available in GenBank. Searching for a human genomic clone containing an EST contig can be performed by a BLAST search in the High-Throughput Genome Sequence (htgs) database. In our example, this identifies the RP11-85A1 clone (GenBank accession number AC007643, a working draft sequence) as containing the totality of the EST contig. 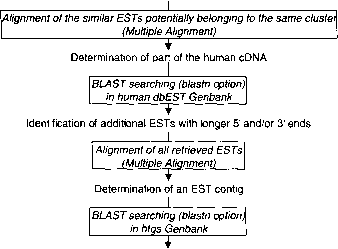 In addition, this BLAST search also indicates the location in the genomic clone of the different exons of the EST contig. Mismatches or gaps in the alignment of the two sequences permit restoration of the most probable sequence. The nucleotide sequence of the EST contig can now be translated into an amino acid sequence according to the three possible 5' and three possible 3' frames using the Translate Tool program.10 As in our example, the first BLAST search with the yeast MRS4 protein indicates that the AV704087 EST is 5'-3' oriented (Fig. 3), and thus only the three translations in the 5' frame must be considered. One of these amino acid sequences should contain the small amino acid sequences homologous to the yeast protein initially identified by the BLAST search (Fig. 3). In our example, the alignment of this incomplete amino acid sequence with the yeast MRS4 protein, using the Multiple Alignment program, reveals a 45.8% homology between the two sequences, with few gaps and obvious consensus sequence blocks in several regions of the proteins, including the C-terminal part (Fig. 4). The total time required to obtain this amino acid sequence is less than 10 hr of computing. However, in our example, the 5' part of the EST contig and consequently the N-terminal part of the protein sequence are missing. At this point, experimental work needs to be started to identify the 5' part of the human MRS4 cDNA. The most efficient way would be to perform 5' RACE (rapid amplification of cDNA ends) on poly(A)+ RNA. This should result in the identification of the ATG translation initiation codon. However, this search was done in December 2000; other ESTs can probably be retrieved when reading this chapter, some of them possibly containing the 5' part of the cDNA.